From Underground Toys! Only the best travel with the Doctor and share in his adventures, and Underground Toys gathers together the companions who battled evil alongside the Doctor in the tenth Doctor's era in this boxed set of 5" scale action figures! 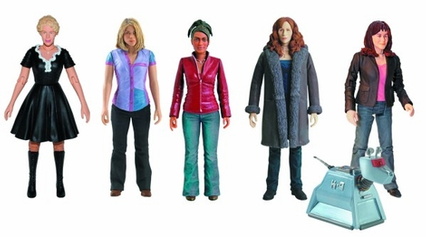 This Doctor Who action figure set includes Rose Tyler, Martha Jones, Donna Noble, Sarah Jane Smith, and Astrid Peth (from "Voyage of the Damned"), along with a bonus K-9 figure!